As Spring settles in to the Prescott area, we are once again experiencing the high, gusty winds which seem to show up during the "Swing Seasons". So named because they contain neither the hot sunny days of Summer, nor the cold short days of Winter, the Swing Seasons of Spring and Fall typically include several weeks of intense wind. Being from Buffalo, N.Y., I often say that I absolutely loathe snow. But, coming in a close second, is wind. 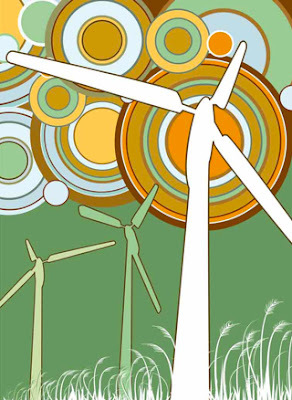 It is usually about this time of year that the conversations about wind power are recycled. "Wouldn't it be great if we could just harness this stuff", I hear people saying. Or, "Let's build a wind farm!" Adding a wind turbine to your menu of energy options is probably more complicated than most people initially imagine. Some of the things that must be considered include the local zoning codes, the initial cost of the investment and (surprise!) whether your property has good wind resources. One of the potential obstacles to installing a wind turbine on your property would be the presence of any existing height restrictions in your zone, particularly if you are in a residential area. In addition, neighbors may object to the location of a wind device that either blocks their view or creates undesired noise pollution. A typical wind turbine produces an ambient noise level of about 52 to 55 decibels, or about the sound level of an average refrigerator. This may not seem objectionable to you, particularly if you are the one who is benefitting from the alternative source of energy. However, your neighbor may have a different opinion. The cost of a wind system can vary widely, from $3,000 to $35,000 depending upon its size, and application. Still, a typical 10 kw wind system would most likely be in the neighborhood of ½ the cost of a photovoltaic system, depending upon the current cost of PV panels, and the dollar value of rebates that are available. Generally, the cost of a wind turbine can be roughly estimated to be $1,000 to $3,000 per kilowatt. Another thing to consider is the initial cost of installation, verses the long-term cost. Smaller turbines require a lower initial investment than larger turbines, but they cost more proportionally per kw produced. The correct location for a wind turbine on your property is probably one half science and one half common sense. There are charts and data that can be obtained (see below) to determine the general wind patterns for your part of the world. And there are instruments to measure wind velocity and direction that can be placed on your land. The best method of measuring wind speed is with an anemometer placed at the location and height you plan to install your device. However, when it comes to your specific piece of property, the power of observation just can't be beat. Pay attention to whether there are intermittent strong gusts of wind, or a fairly constant breeze. The latter is better. It does not have to be tremendously windy to effectively run a turbine. And, unlike solar energy, you can harvest wind energy day or night. And yes, you guessed it: the pairing of wind with solar makes a great combination!